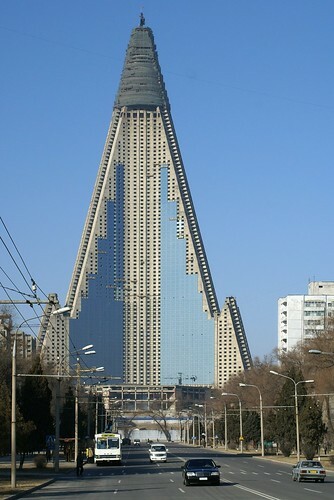 Recently, the North Koreans have started installing glass paneels on the concrete shell of this 105-storey hotel which had been abandoned for 16 years after construction stopped in 1992. An Egyptian firm, the Orascom group, has ventured to restore the hotel. Pyongyang watchers, however, have some doubts about it. It is difficult to imagine why a foreign investor should want to waste his money on this folly. Orascom also helped the North Koreans to launch a third generation mobile phone network which was proudly inaugurated earlier this week. Maybe the reconstruction of the hotel was the price they had to pay for some more profitable operations in Korea. Or maybe this mockup hotel is just a huge tax evasion project?